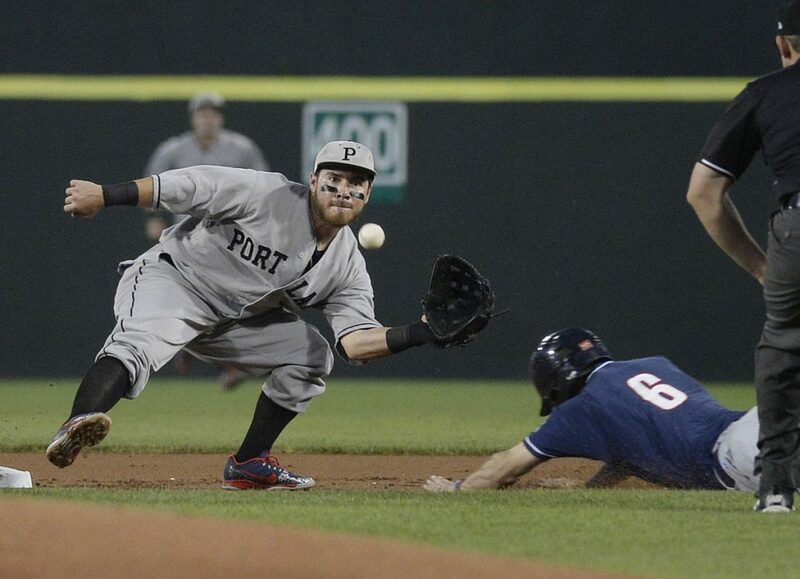 The Sea Dogs manage to pull out a 10-9 win as Portland and New Hampshire combine for 29 hits. 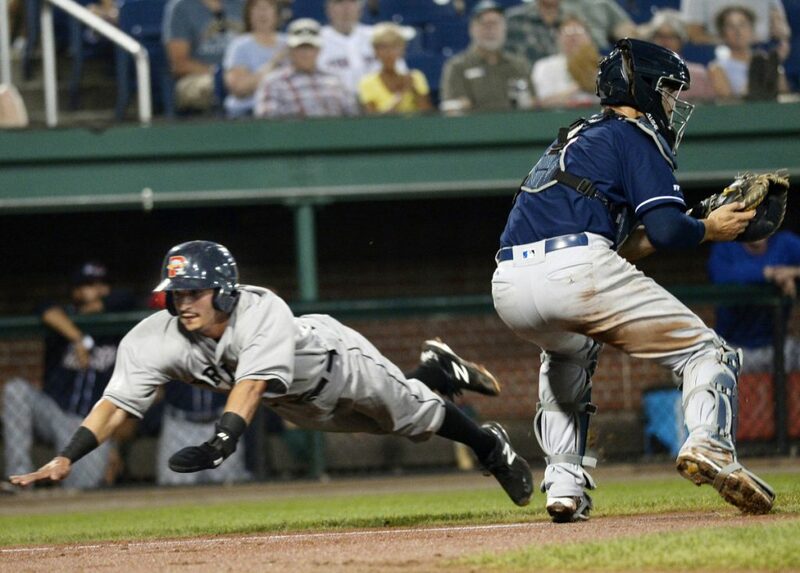 Jeremy Rivera dives past New Hampshire's catcher Max Pentecost to score a run in the first inning. 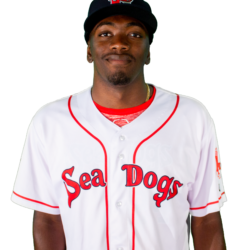 Rivera went 3 for 5 with three runs scored, and the first three batters in the Sea Dogs lineup collected eight hits, five runs and five RBI. 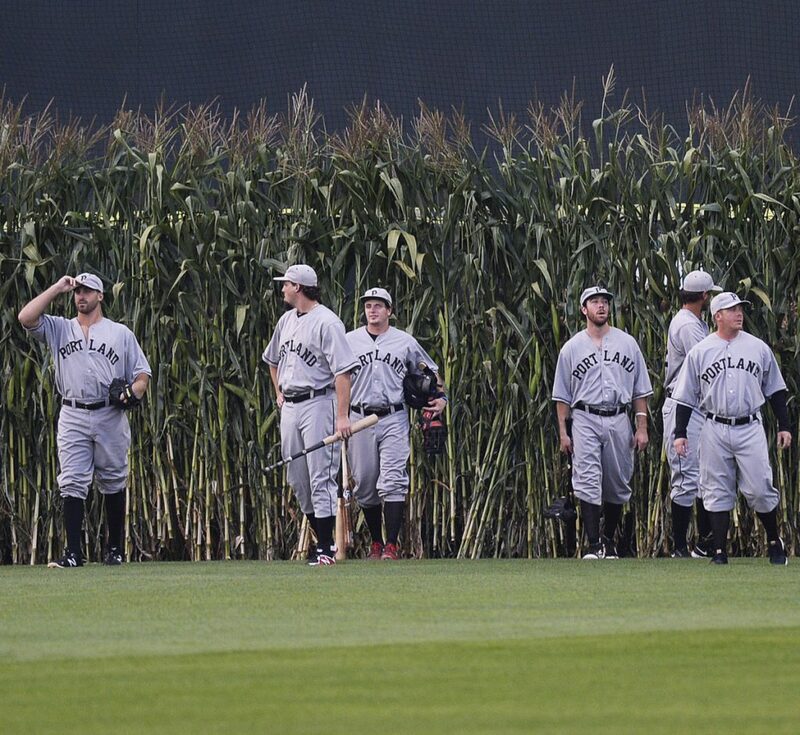 In the annual Field of Dreams game Wednesday night at Hadlock Field, the Portland Sea Dogs again emerged from the cornstalks in center field, wearing replica uniforms of the 1926 Portland Eskimos. Then the ace pitchers from the Sea Dogs and New Hampshire Fisher Cats settled in. Old-fashioned pitching duel? Not quite. The teams combined for 29 hits and 19 runs as Portland squeezed by with a 10-9 victory before a crowd of 6,455. Chad De La Guerra drove in four runs with two hits, including a three-run homer in the second inning. Sea Dogs starter Matt Kent (11-8) got the win, hanging in there for five innings (12 hits, seven runs). Kent’s previous two outings were scoreless, including seven scoreless innings against the Fisher Cats last week. 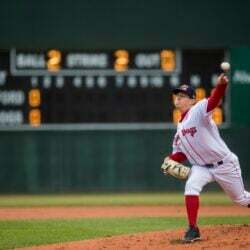 He looked like he might get another quality start Wednesday until New Hampshire pounced for four runs in the fifth inning, cutting Portland’s lead to 8-7. New Hampshire’s Jordan Romano (11-8) gave up 10 hits and eight runs in four innings. The loss drops the Fisher Cats (73-60) into a first-place tie with Trenton in the Eastern League’s East Division. Portland improved to 60-74. Outfielder Luke Tendler also homered for the Sea Dogs. Tendler, new to the Red Sox organization this year, is tied for the team lead with 15 home runs, matching Josh Ockimey, who is now in Triple-A Pawtucket. Middle infielders Jeremy Rivera and Esteban Quiroz each collected three hits. Jantzen Witte (2 for 4) recorded his 50th RBI in only 71 games. Jake Cosart relieved Kent and pitched two scoreless innings, stranding a runner on third in the seventh. Trevor Kelley took over in the eighth. He allowed two runs as the Fisher Cats closed to 10-9, then walked the first batter in the ninth and was relieved by Josh Taylor, who retired the next three batters for his seventh save. NOTES: Continuing their Field of Dreams tradition, the Sea Dogs emerged from the cornstalks in center field and eventually walked through the stands, thanking the fans. … Rivera continues to play well defensively at shortstop and has picked it up offensively. In the last 41 games, he’s batting .331. … New Hampshire second baseman Santiago Espinal went 3 for 4, including a two-run homer. Espinal, 23, was a Red Sox prospect until June 28, when he was traded to the Blue Jays for Steve Pearce. … De Le Guerra has 14 homers for the Sea Dogs and one for Pawtucket. In his last 23 games, he’s batting .285 with six home runs and 20 RBI. … Kent’s ERA jumped from 3.15 to 3.50, but he still ranks sixth among Eastern League starters. … Thursday’s 7 p.m. game is the last home contest for the Sea Dogs. Team awards will be given out before the game. … The Sea Dogs will conclude their season over Labor Day weekend in Binghamton. 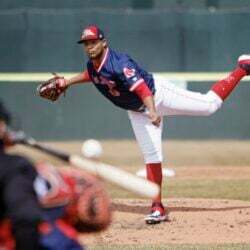 … In Triple-A Pawtucket, Boston third baseman Rafael Devers made a rehab appearance, along with Red Sox catcher Christian Vazquez. Devers went 1 for 3 with a double. Vazquez was the designated hitter and was 2 for 4 with an RBI. Former Sea Dogs starter Mike Shawaryn threw a one-hitter over six innings for Pawtucket.